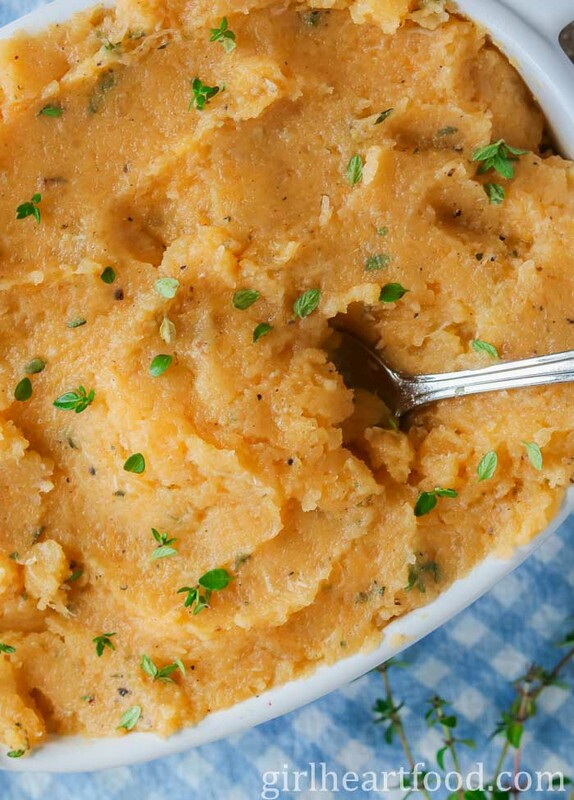 What makes this mashed turnip recipe so special? Though, butter makes pretty much everything better, doesn’t it?? Though, this ain’t just any butter, it’s brown butter. Seriously, you guys, this stuff is straight up DELICIOUS. All my life, I’ve know rutabaga to be ‘turnip’. Though very similar, there are some slight differences. Both turnip and rutabaga are delicious root vegetables. However, rutabagas are typically larger than turnips, a little sweeter, and have a yellowish interior (which is often why they are marketed as ‘yellow turnips’ or simply ‘turnips’. This is the case in many grocery stores in Newfoundland. Both can often be used interchangeably in recipes, as in this one. This is a great explanation here. Besides how delicious this recipe is, it has just seven ingredients (including salt and pepper). It’s one flavour packed, super budget friendly side dish that’s perfect for Thanksgiving, Christmas or any special occasion. Honestly, this would even be delicious as a low carb option to have with your weekday dinner. Brown butter is basically butter that has been cooked until it turns brown. It’s made by melting butter in a pot; as it cooks the colour changes from light yellow to brown. Also, the milk solids start to solidify and brown (as in the pic below). This is a great guide for making your own. Some people don’t use those solids, but I think they add so much flavour to any dish. Do not discard ’em; they are yum!!! They go straight into the mashed turnip for a flava party. Browning just takes butter to another level. It tastes buttery (of course), nutty and kinda caramelly. In a pinch you could use regular butter here, but the final product will taste different. It only takes minutes to make and so worth the effort. And the smell? Heavenly. 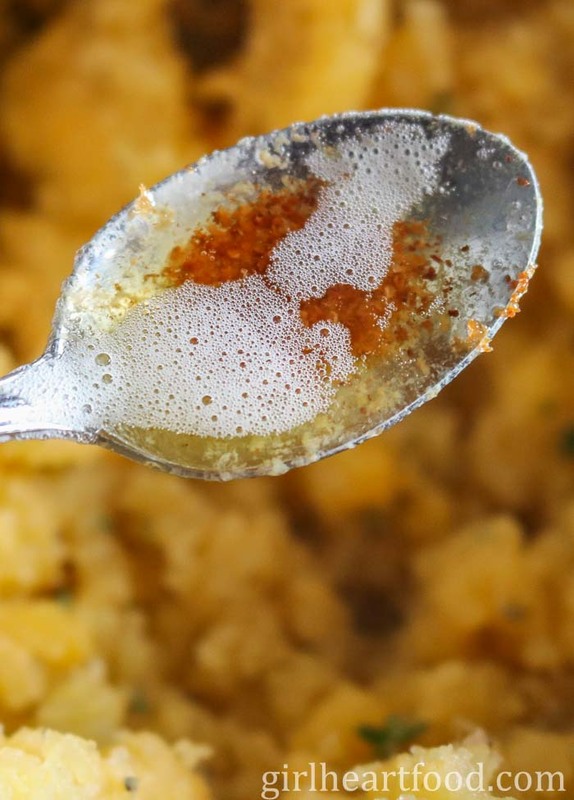 FYI—> as you would have guessed, brown butter also works great in mashed potatoes, with pasta (particularly ravioli) or even on bread (when it’s solidified, of course). Lots of good flavour for a humble turnip, isn’t it? It’s all about using simple ingredients and just treating them with care, definitely nothing complicated. 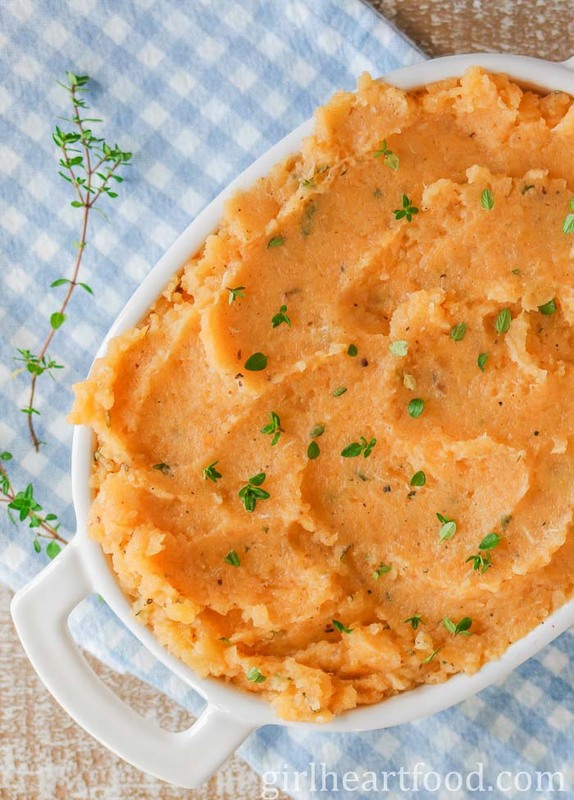 Mashed turnip has always been a favourite side and brings back lots of memories. What’s a favourite side dish of yours? You can use either turnip or rutabaga in this recipe. I used what I know as ‘turnip’, ‘yellow turnip’ (aka rutabaga). More detail on this in the text above. Cut the turnip into bite-sized chunks so they could somewhat quickly. Don’t have fresh thyme? Use 1/3 less dried (so about 3/4 tsp). I used one large turnip that was about 3 lbs (after peeling it’s a little less), but all together you want about 8 cups of turnip chunks. If you have access to a scale in your grocery store, use that to weigh the quantity you need. Whether you call it ‘rutabaga’ or ‘turnip’, I hope you love this easy side dish recipe as much as I do (and I’m pretty sure you will)! Minimal ingredients, a whole lotta flavour - that's what you're gonna get with this Brown Butter Mashed Turnip with Roasted Garlic. It's a simple side dish that would be a yummy addition to any special occasion. 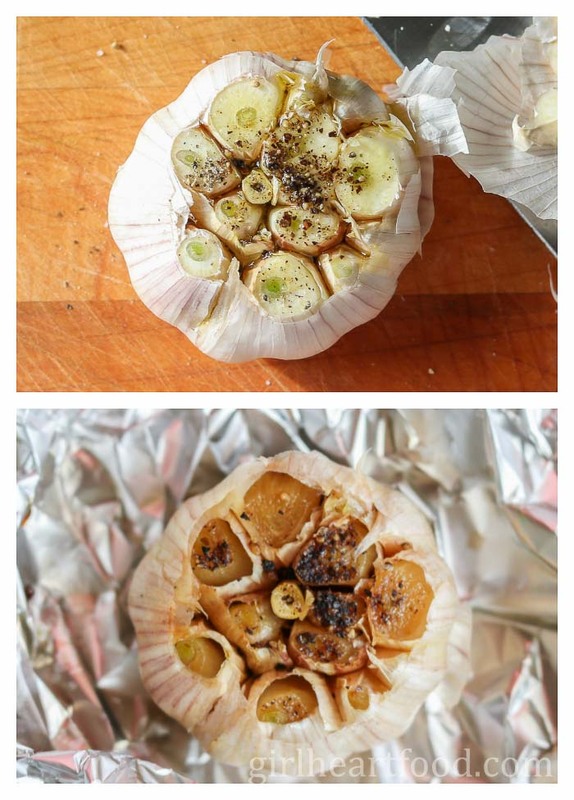 First, get the garlic roasted. Preheat oven to 400 F. Cut tops off garlic so cloves are exposed. Sprinkle with just a pinch of salt and pepper and 1 tsp of olive oil. Wrap in foil and bake about 40 minutes. Remove foil and let cool for a bit before handling. When cool enough to handle, cloves can be removed from skin. Meanwhile, boil turnip (or rutabaga) in large pot of salted water, covered, for about 35-40 minutes or until turnip is tender. Drain. In a light coloured pot over medium low heat melt butter. As the butter cooks (or browns), swirl the pan every so often as it lightly bubbles. The butter will foam and that's ok. The colour will change from yellow to amber to brown. There will be little brown bits form as the milk solids in the butter cook. Don't discard those. They are delicious in this mashed turnip. This whole process should only take about 10 minutes. As soon you achieve the desired colour (I like a light brown) remove butter from pan (because it will continue to cook if you leave in pan and may burn). 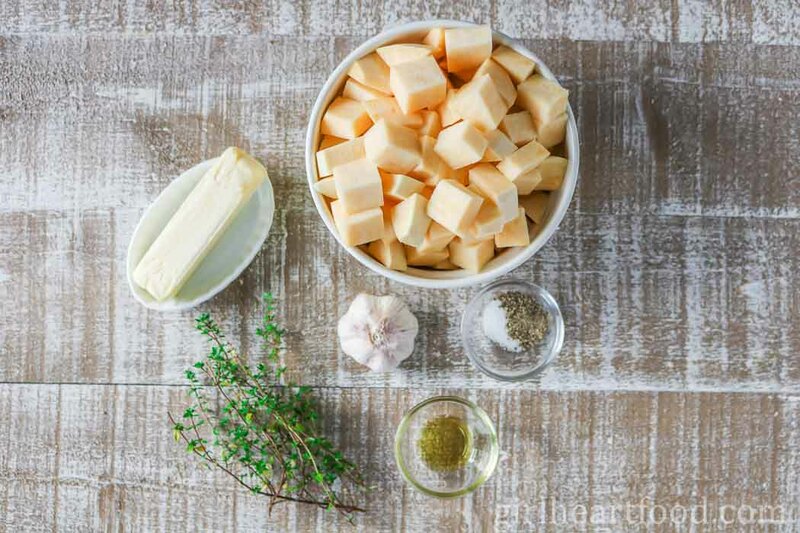 To cooked turnip (or rutabaga), add salt, pepper, thyme, browned butter and mash. Add roasted garlic cloves and mash again. Place in a casserole dish and garnish with additional thyme, if desired. Enjoy! You can use either turnip or rutabaga in this recipe. I used what I know as 'turnip', 'yellow turnip' (aka rutabaga). More detail on this in the text above. Don't have fresh thyme? Use 1/3 less dried (so about 3/4 tsp). I used one large turnip that was about 3 lbs (after peeling it's a little less), but all together you want about 8 cups of turnip chunks. If you have access to a scale in your grocery store, use that to weigh the quantity you need. I just made this! I found that I didn’t really get that lovely orange color (even with the browned butter) so I added a little turmeric to give it a golden color. I also decided to add a smidgen more salt and pepper, plus about 2 tbsp of brown sugar to counteract some of the bitterness of the turnip. Topped it with dried parsley and it’s a lovely, different stroke from mashed potatoes! So happy to hear that, Katie!! If you used ‘white turnip’ it would be a tad more bitter and less yellowy than ‘yellow turnip’ or rutabaga. Thank you for trying and letting me know how it turned out for you 🙂 Have a lovely weekend! This is a great idea for Thanksgiving! 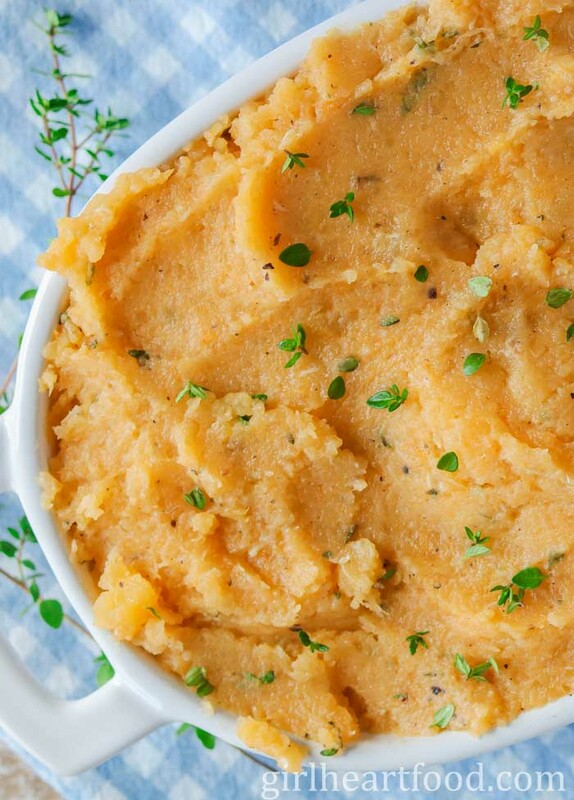 A nice alternative to regular mashed potatoes! Sure is 🙂 Thank you Jasmine!! I think I’ll have to add this to my Christmas meal list! It sounds delicious, yet simple. Thanks! Keith and I LOVE turnips!! I always wonder why more recipes don’t include them? This is a must try! Can you believe I lived on this planet for almost 40 years without knowing how awesome mashed turnips are? Not sure why, but neither of my parents ever cooked with turnips, so they just weren’t on my mental radar. I discovered them quite by mistake a year ago, and am now trying to make up for lost time by putting turnips in everything I can. 🙂 Loving the way you’ve dressed yours up with browned butter and roasted garlic… sounds amazing! When I saw your photo, it made me think about my years living in New England. When I think of turnips, I think of the small white ones with the purple tops. From your photo and you mentioning that it weighed 3 pounds, I knew you were referring to a rutabaga, Swede or yellow turnip. Imagine the confusion when I told my New England friends I was bringing turnips to their pot luck and showed up with my southern version cooked with greens. 🙂 I can’t wait to try this version, it sounds delicious. I’m pinning. Rutabagas are often sold as ‘turnips’ around here and that’s what I grew up knowing them as. So happy you like this recipe, Karen 🙂 Thanks so much & enjoy!! You’ve just transformed a traditional family side into something magnificent! We ALWAYS had mashed turnip growing up, but never with roasted garlic. YUM! I’m craving this so hard now – I am going to have to whip it up soon, maybe with a simple roasted chicken! Love! Thanks a million, Katherine 🙂 Sounds like a delicious plan!! I do love “turkey day dinner” too! And the best part about that is…leftovers. As our family is very small, we usually enjoy leftovers for a while. I don’t think I’ve eaten turnips many times in my life (I am mostly familiar with rootabaga which I believe belongs to a similar family), but I still can imagine how delicious this side is. No wonder – butter makes everything better (And healthier, right)? Gotta thank mom for that 😉 I grew up eating mashed turnip! Thanks, my friend – same to you! Yay for Mom!! I’m embarrassed to say, I’ve never tried a turnip Dawn! But the way you’re talking them up, clearly I’ve been missing something. Need to try these! Right?? You do 😉 Hope you love ’em, Mary Ann! Love this Dawnified version of a classic. Yay for butter! and double yay for browned butter! PInned! Lol…thanks so much, Elaine 🙂 Hope you love it as much as we do! Dawn, I’ve never mashed a turnip – Ive roasted them (yum!) but never mashed, And, brown butter and roasted garlic? Heck, sign me up for that yumminess! I love this idea! I’m going to have to give this a try, I imagine the fam will love it as well, with all that buttery, garlicky goodness! Thanks for the inspiration! Bet you guys will love it…sure hope so 😉 Thanks Laura! Mashed turnip might not sound cool but I can fully appreciate the deliciousness lurking behind the phrase! Your mom knows her stuff:) Great side, truly. Pinned! Dawn this is a brilliant side dish – first off,I don’t think I’ve ever had a turnip mash – so genius! And flavoring it up with roasted garlic -wow! I’m thinking I need to bid adieu to mashed potatoes and have this instead! Oh my goodness Dawn! You have taken turnip to a whole new level! I love the brown butter and garlic twist. And now I’m also totally excited for Christmas Day dinner and all the sides! Hope your week is off to a great start! Thanks Leanne! I’m already thinking about it 😉 Happy Monday to ya! I LOVE everything about this dish but the turnip! I don’t totally dislike them. In fact, these ingredients may be what have been missing! But I’m sure they could be made with 1/2 potatoes also. That would be a great start. Lol…I think this recipe will change your mind 😉 Sure hope so! Thanks so much! I never make mashed turnips but these look like they are packed with all the garlic flavor. These would be perfect for any holiday table! Haha! Admitting to loving turnips definitely makes you uncool, Dawn…but I’ll join the uncool club with you if it involves roasted garlic and browned butter. Seriously! This dish sounds like it’s packed with a ton of flavor, and I love how you use a ‘lesser known’ – or maybe ‘lesser loved’ – root veggie as the base. Perfect holiday side dish! Lol…I thought so 😉 It really is yummy! Hope you get a chance to try it soon, David. Thanks so much! I LOVE root vegetables! I almost always opt for roasting (except mashed potatoes of course) but I’m totally going to try mashing some turnips soon. Nothing beats a dish loaded with butter and roasted garlic. And since it’s a vegetable, it’s automatically healthy even with all that butter right? 🙂 Have a great week, Dawn! Me too! And I totally agree 😉 You too, Kelsie! Thanks very much! I’m all about the sides too! Roasted turnips would be a fun addition to the holiday table! I love that you’ve added browned butter. This sounds really delicious! Brown butter adds such a lovely flavour! Thanks Kathy! Yummmm…that browned butter! Can you believe I’ve never had mashed turnips before? I substitute them into soups for a low carb alternative to potato. After all the cauliflower mash I’ve had – why did I never come across mashed turnips?! It’s brilliant! And they look so delicious! I’ll definitely have to try them soon! Really? So yummy! I grew up on ’em 🙂 Hope you love them, Kelly! Oh this sounds delicious! Cannot wait to try! Thank you so much, Linda 🙂 Hope you love it! !